Unity being the primary message of the Sufi Order, kinship with all beings permeates our activities. Our spiritual development moves us to be of service to others, which we express through the Kinship Concentration. The Hope Project near the Dharga of Pir-o-Murshid Hazrat Inayat Khan in New Delhi, India has been our major fund-raising focus so far. The purpose of life is not fulfilled by realization alone. The sense of sympathy and responsibility toward all life is expressed by the spiritual person in making a contribution toward improving the conditions of life. Individuals, Sufi centers and communities have found ways to concretize through service the ideals to which we aspire. These include food banks, soup kitchens, holiday gift baskets, counseling, birthing and health clinics, prison book funds, transformational theater, school projects, involvement in community organizations and interfaith groups, and so on. 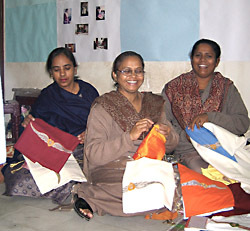 Major international fund raising has concentrated on the Hope Project in New Delhi, India. Guided by the spiritual ideals of Pir-o-Murshid Hazrat Inayat Khan, the Hope Project is driven by the spirit of service to humanity and respect for all religions. It strives to provide people, especially the poor and vulnerable, with opportunities and resources, so that they can realize their hidden potential and are able to help themselves. Currently the project runs a community health center, a crèche, a school, vocational courses and income generation projects for the poor. The project has 50 Indian staff members and is financed largely by private donations. Contribution instructions are at the Hope Project's website, or in Canada contact Leslie Gabriel Mezei using our contact form. The Universal Worship is a full member of the Toronto Area Interfaith Council as a faith group. The Council is currently developing a food bank and social service information project, in which we plan to participate. For more information about our Kinship activities, you can write to us using our contact form, or registered members can post to our Kinship discussion forum. The Sufi Order's Kinship activity concentration also has it's own website. The greatest tragedy of the world is the lack of general evolution.